Eliminate the mess and concentrate on the rest. Learn how “less is best” and much easier to manage and maintain! Home management is not easy. When clutter and disorganization get the upper hand, peace, joy, and comfort go out the window! Your Home Matters will help you discover what will work for you, right where you are, with what you have. Manage your stress and keep money in your pocket with simple ways to keep your home organized and clean. 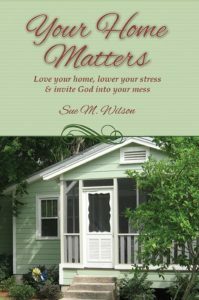 Reclaim your home from the clutches of clutter and full it up with peace, joy and the presence of God! Your home matters, matter – because your home really does matter!